Ririka is a young up-and-coming actress. In order to become an international actress, she is currently aiming to learn both English and Italian. 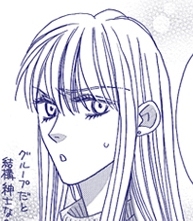 Though her speech and actions betray a strong egotistical nature, she is very sociable and has not problems getting along with people of disparate age groups like Yunosuke and Baxter.